Spplies are the same as Drawing 101 except the addition of 2 lessons in Conte Sketching Pencils (black and sanguine). The class is taught assuming students know how to transfer their drawing to their sketchbook, though some tips are provided; basic highlights and shadows as taught in the prerequisite course. This class is appropriate for artists working in any genre – cardmaking, fine art, animé, etc. Lessons are taught on a small paper – each is 4-1/4″ x 5.5″ but can be adapted to a larger size as desired – just remember if you double the size of the paper, you may need to double the size of marker strokes. Oh, I love this class… I learned to color with new mediums, also to draw realistic. 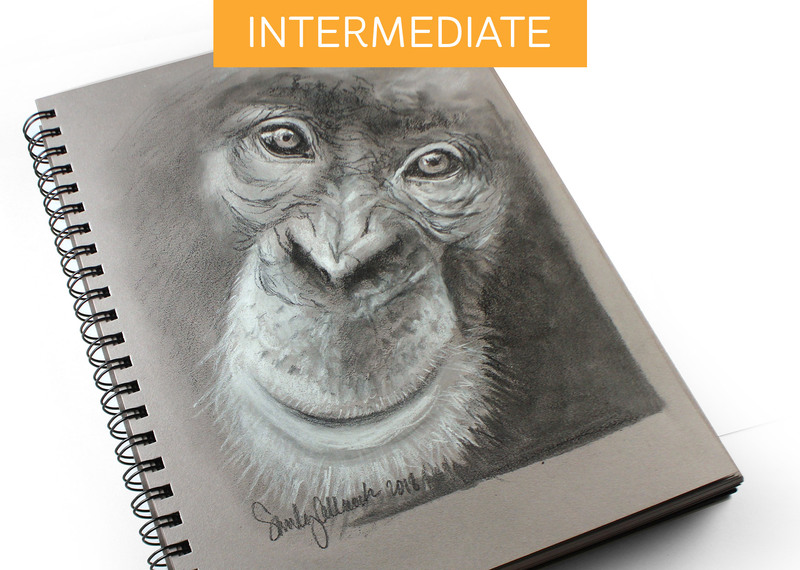 I love the animals and want to try more of the wild animals… This course is for people with a little experience in drawing. The picture all, looks fantastic and it is a fun going through this class. Awesome class! What more is there to say! Learned some new mediums and techniques.